Bartholomew and Thomas define theological interpretation broadly as “interpretation of the Bible for the church” (ix). In this volume, they identify key issues and chart a path for those flying under this banner. Their version is interdisciplinary, ecumenical, and involves the broadest spectrum possible between the churches and the scholarly guilds. The “manifesto” they provide (1-25) is the collaborative effort of a group of scholars associated with the Scripture and Hermeneutics Seminar. In their understanding, this statement “tries to make public the central tenets that help to orient theological reading of Scripture so as to hear God’s address” (x). The manifesto also highlights areas “informing theological interpretation that may otherwise be ignored or neglected in the reading of Scripture” (x). The essays that follow exposit each of the twelve sections of the manifesto and are intended to flesh out what a theological interpretation of Scripture might look like from these angles. 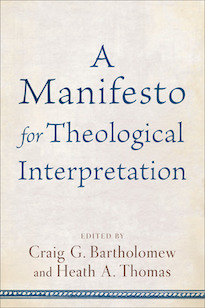 In short, their manifesto argues that contemporary theological interpretation of Scripture is a reemergence of an ancient practice (1), that affirms a robust view of divinely inspired Scripture (2), that values the central context of the church (3), that sees itself as a reasonable alternative to historical criticism (4), that selectively utilizes insights of hermeneutics and philosophy (5), that seeks to reckon with the nature of the Bible as a canonical collection (6), that makes use of the resurgence of biblical theology (7), that emphasizes the role of mission (8), that involves the goal of transformation (9), that includes shared theological commitments (10), that sees the necessary connection between theology and exegesis (11), and that is committed to the creative application of Scripture to all of life (12). The manifesto itself is carefully worded, and the essays are strictly focused on their given topic. This feature gives a tight coherence to the volume and makes it an important methodological resource. The range of issues addressed also demonstrates the value of the book and the challenge of this broad approach. Reading through the volume will allow someone to grapple with the daunting but exciting reality that the theological interpreter can never be the master of only one skill set. This scenario points to the need for generalists in the churches and the academy. One of the difficulties faced by the theological interpretation movement is a sense that the approaches that fly under its banner are so diverse that it is a mistake to characterize them together. Perhaps a gentle critique of this project might be with the singular noun in the title. Even though each of the contributors aim at expositing a central tenet of the primary affirmation, these essays sometimes feel like a series of individual manifestos that nevertheless bear a striking family resemblance. But, perhaps, this might be a welcome metaphor. As with any healthy family reunion, the diversity present around the table of biblical interpreters highlights their unifying filial identity and the fact that they gather around a shared scriptural feast. As Bartholomew and Emerson conclude, this family of theological interpreters aims to “work out what biblical interpretation might look like as an expression of the obedience of faith” (273). This volume contains an ambitious roadmap (or perhaps treasure map) that locates several ancient paths that hopefully more and more readers of the Bible will seek to traverse.